Purée 3/4 cup milk, water, eggs and salt in a blender for 30 seconds. Add the flour and blend until smooth, about one minute. Scrape down the sides of the blender with a rubber spatula and pour in the melted butter. Blend about thirty seconds and pour through a fine-mesh strainer to remove any lumps. Refrigerate in a covered container for at least two hours or overnight. Check the consistency of the batter before making the crepes; it should be the consistency of heavy crème. If thicker, thin it with a little milk. Heat a 9-inch sauté pan or crepe pan over medium-high heat and coat with a thin layer of butter, plus a little oil. Ladle about 1/4 cup of batter in the center of the pan, tilting and swirling to spread it evenly over the surface. Cook crepe over medium heat until golden and easily loosened from the pan, one to two minutes. Flip it over, and cook for another thirty to forty seconds. Layer the crepes like shingles on a parchment-lined baking sheet to keep them from sticking together. Once cool, the crepes can be stacked, wrapped in a plastic wrap, and refrigerated or frozen until ready to use. The batter will thicken as it sits, so just add a little milk to thin it before cooking. Add the rosemary to the batter. The thinner the batter, the lighter the crepe. Combine the cream, onions, herb sprigs, and bay leaf in a small, heavy-bottomed saucepan and bring to boil. Lower the heat to medium-low and cook until the cream is thick enough to coat a spoon, about fifteen minutes. Don’t let the cream boil over as it reduces. Pour the cream through a strainer. You should have about 1 1/2 cups. If there’s more, return the cream to the pan and reduce it further. Whisk in the Dijon and the chopped herbs and season with a pinch or two of salt and a pinch of pepper. Keep the sauce warm over low heat until you’re ready to serve it. Make-ahead tip: You can make this sauce ahead of time; it keeps in the refrigerator for a day or two. Tear the chard leaves away from the stems, wash, and drain in a colander; trim the stems, remove the strings, and slice on the diagonal, about 1/4-inch thick. You should have 6 to 8 cups of leaves and 1 heaping cup of stems. Heat one tablespoon of the oil in a large sauté pan and add the leeks, chard stems, 1/4 teaspoon salt, and a pinch of pepper. Cook over medium heat until tender, about five minutes, adding a little water if needed. Transfer to bowl. Heat the remaining oil in the pan and add the chard leaves, garlic, 1/4 teaspoon salt, and a pinch of pepper. Cook over medium heat until tender, about three minutes. Add the spinach and cook just long enough to wilt, about one minute more. Transfer to a colander. When cool enough to handle, use your hands to squeeze as much moisture as you can from the greens. Coarsely chop and add to the leek mixture. Add cheeses and season with salt and pepper to taste. Preheat the oven to 375°F. Place the crepes on a flat work surface and spread 1/4 cup filling over the bottom half of each crepe and fold the top over the filling. Fold in half again, to form a quarter circle. Place the filled crepes on a parchment-lined baking sheet, brush each on top with a little milk or cream and bake until hot, about 15 minutes. 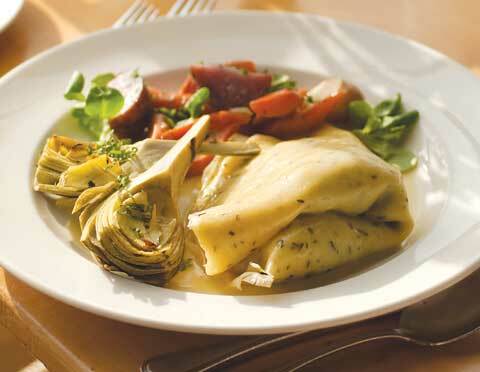 To serve, place two crepes, slightly overlapping, on each plate and ladle about 1/4 cup of the Herb Cream over them. Tip: Be sure to squeeze the excess moisture from the greens before you combine them with the leeks and cheeses for the filling. Otherwise, the filling will be too wet and the crepe will be soggy.